KIDS PAK – Kids in the Loveland Schools often go hungry over the weekend when school meals are not provided. Loveland Rotary oversees a program to provide packs of nutritious food for kids to take home on Friday afternoon. Kids in need of assistance are identified by school staff. 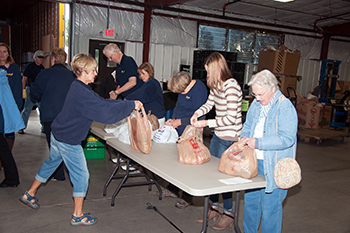 In partnership with the Larimer County Food Bank, Rotarians and other community members pack the bags and distribute them to each of the schools in the district. The hope is that the kids come to school on Monday with full tummies and ready to learn. People can contribute to this effort through the Loveland Rotary Foundation, earmarking their contribution to KIDS PAK. INTERACT – Young people between the ages of 12 and 18 are encouraged to join the Interact Club to participate in worthwhile community projects while learning communication and leadership skills. A version of regular adult Rotary, the youth raise money to provide Shelter Boxes for people in crisis all over the world. They assist with Rotary projects and learn more about service to the community. 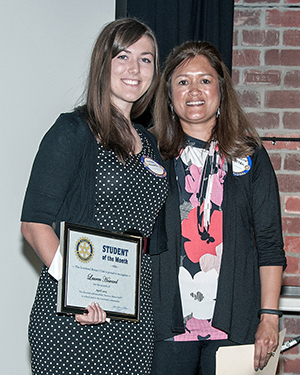 SCHOLARSHIPS –Since 1977, Loveland Rotary has awarded more than 200 scholarships totaling about $500,000. While academic scholarships have been the focus, in 2014 the organization began awarding Vocational Scholarships to worthy students. In that first year, five vocational scholarships were awarded and the goal is to award 10 in 2016. During the annual Governors Art Show, which is sponsored by Rotary, three student art scholarships are also awarded. Anyone can contribute to this program by donating to the Loveland Rotary Foundation and designating their gift for a particular type of scholarship. 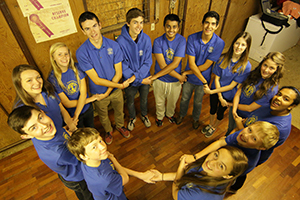 ROTARY YOUTH LEADERSHIP AWARD (RYLA) is Rotary’s leadership training program for young people. Two 6-day sessions are held each summer: one in Larkspur, CO for students completing 7th grade and one at the YMCA of the Rockies for students completing 11th grade. Students learn team work and leadership skills and gain self-confidence, along with having a lot of fun. Participants describe the program as life changing and insightful in their relationships with others. 4-WAY TEST PROGRAM – Loveland Rotary Club members facilitate discussions in small groups on ethical issues facing 8th graders in every Middle School in the district. They encourage the youth to use the Rotary 4-way test to help them make good decisions. Each student is given a coin on which the 4-way test is inscribed: *Is it the truth? * Is it fair to all concerned? *Will it build good will and better friendships? *Will it be beneficial to all concerned? ROTARY ETHICS SCHOLARSHIPS — All three Rotary Clubs in Loveland together with the Better Business Bureau select a finalist to complete regionally for a $5,000 scholarship funded by the Better Business Bureau. Students compete based on their essay about how the 4-WAY TEST has impacted or could impact their lives. ROTARY YOUTH EXCHANGE – Each year, Rotary sponsors a student from abroad to live and attend school in Loveland. 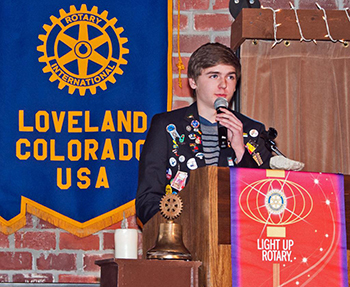 In addition, Rotary sends a Loveland student overseas to participate in Rotary International’s Youth Exchange Program. This program fosters international understanding and acceptance of people from different cultures and backgrounds. STUDENT OF THE MONTH RECOGNITION PROGRAM — During the school year, the Loveland Rotary Club recognizes two students from each of the five high schools in the Thompson School District. The counseling department is in charge of determining the students. The Loveland Rotary Club recommends that the school consider students who have excelled while overcoming some type of adversity. Each student receives a framed certificate and a check for $500. 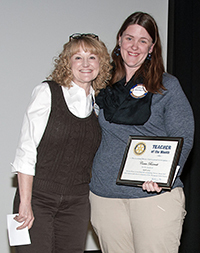 TEACHER OF THE MONTH RECOGNITION PROGRAM – Each month during the school year, a teacher from the Thompson School District is honored at a Rotary meeting. Teachers are nominated by school staff and selected by a Rotary Committee. The nominator shares the story of the honored teacher at a Rotary meeting. Each teacher receives a framed certificate and a check for $500. 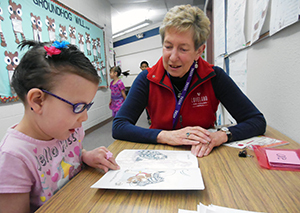 LITERACY COMMITTEE – In an effort to improve reading skills by the end of third grade, students who are identified by teachers work one-on-one with volunteers in a special Rotary program. Volunteers work with students once a week and help first, second and third grade students to improve their reading ability. 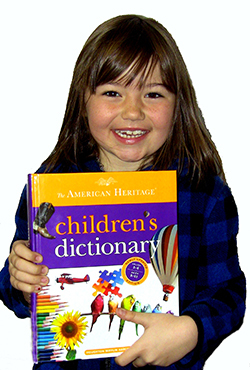 DICTIONARY PROGRAM – Rotary purchases and delivers high quality hardbound dictionaries every fall to all third graders in Thompson School District, as well as those in charter schools, private schools and home schools within the district. 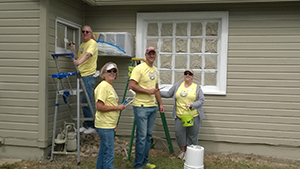 PAINT OUR TOWN – Each fall Rotarians join with other service club members and volunteers to paint houses of Loveland residents who for one reason or another cannot undertake such as task. They help those in need and in so doing help maintain good homes and attractive neighborhoods. VOCATIONAL SERVICES – This Rotary effort channels the professional and vocational expertise of club members into various local youth programs – in particular judging for Science Fairs and DECA conferences. Rotarians also act as coaches and mentors for the Thompson School District Entrepreneurship Program.